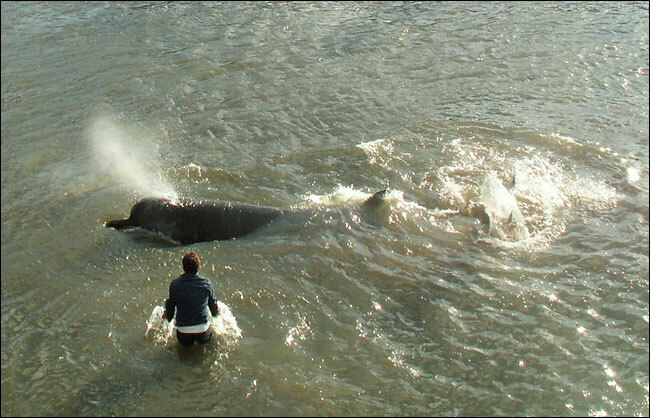 Edwin Talliwell attempted to usher a northern bottle-nosed whale away from the Chelsea embankment of the Thames River. LONDON, Jan. 20 - As urban pursuits go, it had the ring of the strange and the short-lived: whale-watching on the River Thames. Of course, London's great stream is no stranger to the bizarre and fascinating. There have been bodies hung from bridges, seals and porpoises in the water and even a piranha that fell from the sky when a sea-gull dropped it onto a boat. But when a northern bottlenose whale measuring around 17 feet and weighing up to 7 tons was spotted today heading upstream near the London Eye Ferris Wheel, the Houses of Parliament and Big Ben, even the most jaded Londoners sensed they were in the presence of something unusual. "There have been dolphins and porpoises but we've never heard of a whale here," said Carla Redmond, 21, a disc jockey on a pleasure boat moored on the river. Experts said it was the only whale-sighting in over 90 years of formal records. Thousands left their offices to line the river to watch. TV helicopters took to the skies. Friends exchanged text message photographs of sightings. At one point, in early afternoon, the whale seemed to beach off Cheyne Walk - one of the most fashionable streets in already fashionable Chelsea - and a man waded into the Thames, flapping his hands to get the whale back into deeper water. "It's quite surreal," said a BBC television reporter as she bobbed in one of the flotilla of small boats that formed in an attempt - unsuccessful by nightfall - to herd the whale back downstream. Plumes of water from the whale's breathing hole marked its slow, zigzag progress, hither and thither, as the tide changed. It blundered into a moored pleasure boat, its big dark tail flapping forlornly in sharp contrast to the usual whale-watching images of T-shaped tails over crystal waters. It evoked something of the magic that comes when one species meets another at close quarters - like sitting with mountain gorillas in Rwanda or stalking lions by open Land Rover in Tanzania. And it touched something, too, in the soul of a nation with a traditional fondness for waifs and strays. "I hope somebody escorts it out to sea again; otherwise it's going to get a bit confused," said Joan MacLeod, a retiree from Guildford, south of London, as she disembarked from a river cruise - without, disappointingly, sighting the whale. "I think half of London will be out there trying to rescue it," said her husband, Michael. All in all, it was a mystery, many on the river bank and elsewhere agreed, particularly since whales of this kind usually inhabit the deep, cold waters of the northern Atlantic off Norway, rather than the murky, brackish shallows of the Thames. Generally, the northern bottlenose whale is held to be one of the deepest-diving whales, capable of plunging up to 3,000 feet under water to hunt quid, starfish and other prey by using its sonar capabilities. To reach central London, moreover, the whale must have crossed the Thames Barrier, a series of movable gates downstream from central London designed to guard the city from flooding. "I wonder why it's here, I'm curious about it," said a man on the Golden Jubilee Bridge who identified himself only as Sean, 43, a vendor of the Big Issue, a magazine usually sold by homeless people. "Number one, I wonder how it managed to get past the Thames Barrier, which you know can't be that easy for a whale,"he said, "unless it does Free Willy tricks or something. I'm concerned: why would a whale choose to come up the river? I just hope they get it back in one piece." Liz Sandeman, a spokeswoman for Marine Connection, a not-for-profit whale and dolphin protection group, said: "No one will ever know why this animal has come up here." According to Richard Sabin, an expert on whales and dolphins at London's Natural History Museum, there has been no sighting of an animal of this kind in the Thames since records were first kept in 1913. That did not prevent the theories among onlookers, though the facts remained scant: had its sonar systems been damaged? Had it been following food? Was it sick and seeking a place to die? Was it simply disorientated? Would the whale survive? "The last few hours have given me great concern," Ms. Sandeman said as night began to fall. There were reports today, Ms. Sandeman said, that a second whale had been spotted in the sea off Southend, near the mouth of the Thames, and seemed distressed. Were the two mammals related? According to the Press Association news agency, Alan Knight, a spokesman for the British Divers Marine Life Rescue Group, said: "Yesterday we had a report of two whales going up the Thames and we sent divers but we found only one." "About 6 p.m. it went back out again," he said. "Then at 8.30 a.m. today we got a phone call from someone on a train who thought they had just hallucinated and seen a whale going up the Thames near Waterloo Bridge." Pamela Kent contributed reporting for this article.